8 Signs Of Overtraining | JustRunLah! It cannot be stressed enough the dangers of overtraining. It is east to get caught up in the moment and become overly-enthusiastic about running, so much so that we keep pushing our body to the limit. More isn’t necessarily always better. Overtraining can lead to a decrease in fitness level and even injury. A good training plan strikes a balance between running and recovery. Here are 8 signs of overtraining. The best telltale sign of overtraining is a decrease in performance despite increased intensity and volume of training. 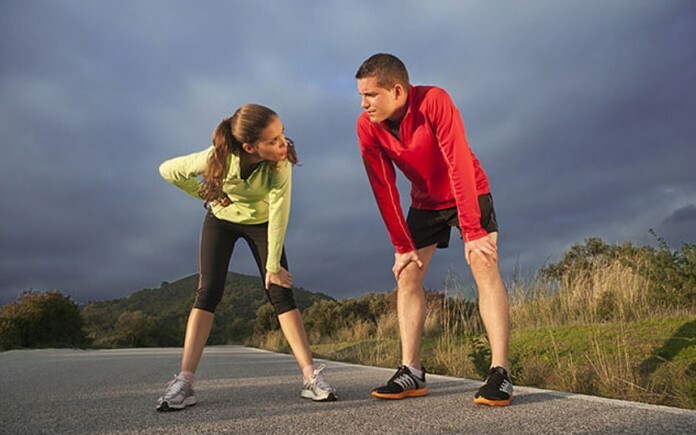 Decreased strength, decreased speed, decreased stamina is a sure sign of overtraining. If you’re doing the same workouts, hitting the same timings, but you feel they are getting increasingly harder, this is another sign of overtraining. You will your heart rate is unusually high and you would also feel unusually uncomfortable during the workout. For instance, your easy runs may start to feel difficult. Heavy legs after a hard session of training is normal. What is abnormal is if you feel constantly fatigue and have low levels of energy. This is because your body hasn’t had a chance to fully recover from the hard workout you put it through. Either you are not resting enough, or not fuelling yourself sufficiently to give your body the building blocks to recover. Insomnia could be due to the production of excessive stress hormones. Sleep is when your body rests and recover. Having insufficient sleep means your body is unable to relax and recover properly. Overtraining can lead to hormonal imbalances which suppresses appetite. It becomes a dangerous cycle. Overtraining leads to fatigue and hence a decrease in appetite. When you eat less, your body isn’t provided with the building blocks to allow your muscles to recover. Then this becomes a vicious cycle. Some people thrive on competition and tough workouts. The moment they aren’t hitting the numbers, they start to get sad, anxious and depressed. They may even start to dread the idea of going out for a run. If you are experiencing this, immediately hit the reset button. Forget everything about pace and distance, just head out and enjoy your run. Are you getting snappy and easily agitated? Are you constantly moody? Overtraining does lead to hormonal imbalances which also causes this snappy mood of yours. If you’re also getting easily irritated and find that you lack focus and concentration, this probably means you should take a step back with your training. This is a very sure telltale of overtraining. Frequent overuse of muscles and joints can cause constant joint and muscle aches. Also, your body immune system is low when you overtrain. It is not easy for your body to fight infections. So if you’re find yourself falling ill quite a bit, take a couple of days break before resuming training. these are too obvious reasons they are NO indication of Non-functional Overreaching or the Overtraining syndrome.